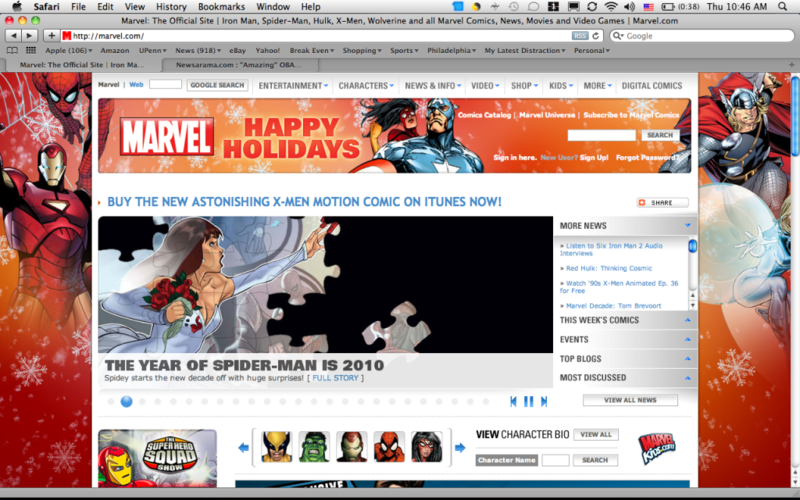 The final piece to Marvel’s 2010 Spider-Man teaser image can be seen on their main site, but for some reason it’s not part of the article yet. 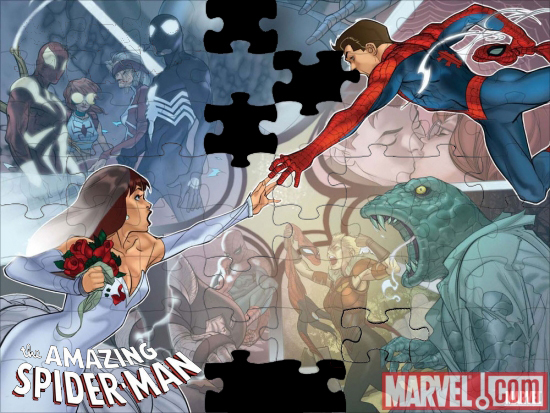 Looks like the magically undone wedding will be the focus of this year’s Spider-Man stories. What does 2010 have in store for Spider-Man? The Gauntlet, a Spider team-up, the Juggernaut, romance with Carly Cooper, and an explanation of what happened on the day of Peter and Mary Jane’s wedding. Good luck, Spidey. I want it to be my Harmony remote. I want it to have a kickstand of sorts, that it can function on my coffee table as a digital picture frame. And when I need it, simple tap – and there are all my media functions….Watch DVR, Watch DVD, Listen to iTunes, Listen to iPod, Play Wii, Play XBox, blah, blah, blah, blah. I want it to have my Comcast screen ON the tablet when I am looking through my TV choices. Because….come on…if this thing functions as my Harmony all-in-one remote, why should I click a button to scroll through selections when I could simply flick my way through channels the way I do photos on my iPhone. And think of how much easier it would be to search for a show! Oh – and that kick stand feature….how handy would that be in the kitchen? I could simply have it on the counter with a recipe pulled up. I want it to work with my little Apple Remote….because it is SO annoying that my Mac Pro and Apple Display do not. Seriously. And voice command…..because what if my cooking has gotten so messy that I wouldn’t even want to touch my Apple Remote that is still wrapped in plastic? I think that is about it. Really I don’t think I would use it for much more. Sounds like a reasonable purchase right? Today was supposed to be something the comic buying world had not seen for a long time (if ever), a Wednesday (or Thursday) without new comic books. Upon first hearing that comics’ central distributor, Diamond Distribution, would not be shipping new books this week, I was admittedly sad and disappointed. That seemed to quickly change to a sense of relief in having a week to catch up and save a few dollars (what can I say it’s a weird hobby). I’ve come to find out that there will be new books today as some publishers have decided to work around Diamond. Several months ago, I embarked on a journey into sound. In an attempt to clear the clutter from my life I came across a treasure trove of old Philadelphia punk rock cassettes. So I armed myself with the technology I needed to bring these things back to life, namely an old cassette deck, an RCA to 1/8″ adapter and Apple’s GarageBand software. I have to say, while time consuming, this process has been incredibly fulfilling. 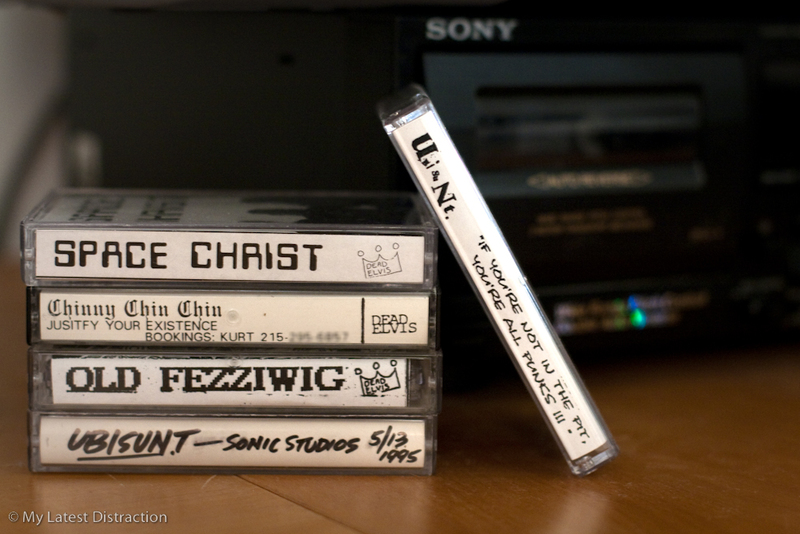 I can once again enjoy the sounds of Space Christ, Chinny Chin Chin, Old Feziwig, and even a few rare gems from Ubisunt. Yes, the quality is terrible when compared to other items in my iTunes library, but the tape hiss and imperfections are part of the music at this point and I wouldn’t have it any other way. I’m also converting some old VHS tapes to digital video just to complete the cycle. Look out Saturday Night’s Main Event 11/28/87, you’re next!